Public sector banks: Three fourths of the staff performance review is on 3rd party products! A professor who retired from Osmania University a decade back got arrears under the 7th Pay Commission. He went to a manager of a public sector bank (PSB) seeking his advice. The manager promptly advised him to invest in insurance or mutual fund products. When asked, why not in term deposit with banks, the manager had the audacity to reply that bank deposits have less liquidity and security to this 70 year old person! Enquiries reveal that he is judged by performance not in the banking products of credit and deposits but in cross-sold products. Three fourths of the monthly and annual performance reviews of banks are on third party products and the State Bank of India (SBI) chairman recently listed his priority in such products. Third party products carry fat commissions – only lakhs and crores of rupees per annum. Good banking and safe as well as insurance for sure and in time are the needs of a growing economy; but who cares? There is a chorus for privatisation of the PSBs, lately joined by the governor, Reserve Bank of India (RBI). If the history of nationalisation were to serve as a backdrop, notwithstanding the then political overtone for such move, and its predecessor, the social banking initiative of the Morarji Desai government, the vast expansion of branches into rural areas, finance to the till then neglected sectors and population and the decline of costly private money lending to around 60% from 90%, cannot be wished away. Bank chairpersons fancily posed for photographs with farmers and small enterprises in the media for two decades after nationalisation. They competed to project the implementation of the Integrated Rural Development Programme (IRDP) and Self-Employment for Educated Unemployed Youth (SEEUY) among many, cursing the defective identification of beneficiaries for those schemes. Rajiv Gandhi said in Orissa that only 16% of such sponsored schemes reached the intended beneficiaries. There can be no dispute that the reach of banks to these areas has significantly improved and enabled the government to dovetail many a scheme. State governments vied with each other to create corporations for SC/ST , women, minorities and BCs to reduce their budgetary responsibilities with the support of PSBs. Post 1992, or post liberalisation, the PSB focus shifted to profits from society benefits. Compulsive targets under priority sector are always shown as achieved. Sector experts on PSB boards became non-entities. Governance became accountable to the government and not to the society. Due diligence that was banks’ exclusive forte dispersed to elusive sponsors of various credit schemes. PSBs in their urge to compete, aped the western business models. Instead of making technology a servant, banks became servants of technology, ignoring the customers and clients. Credit risk management has become more regulatory compliance than institutional necessity. The appraisal memoranda of the banks incorporate risk management, but it is just a quote of CRISIL, ICRA etc., and not comprehensive. Policy analysis, sovereign risk analysis and detailed due diligence reports on directors of companies and partners of partnership companies are imperfect, false, or routine. The department of banking that has limited knowledge of banking supervises the PSBs. Why not the government accept the Narasimham Committee recommendation to wind up the department and reduce its stake to below 50% at least now? RBI’s regulatory rigour is at best glossed over and at worst uncared for by PSBs, with impunity in the guise of independent micro management. RBI stopped inspecting the sample branches and sample accounts as part of its inspections of banks and confined it only to head offices, corporate offices etc. The phenomenal surge in frauds in banks during the last ten years mirrors lack of data analytics to take appropriate timely actions. One single giant fraud of PNB led to a series of disclosures from several other PSBs leading to arrest of top management executives. This is the tip of the iceberg. The villain of the piece is greed generated by sale of third party products in preference to core banking. Infrastructure lending has already proved a bane and real estate lending is the next sector waiting to explode. Both have facilitated arm-chair lending for the banks that operated with least staff. Staff resources are today top heavy and bottom lean. Coming to privatisation, look at the HDFC Bank whose market share is on the rise continuously. Unlike anywhere in the world of banking, this bank is allowed to have a chairman for 25 years in Aditya Puri. Is this good corporate governance and good regulation? But for KV Kamath finding his place in the newly set up Asia Bank, the story would have repeated in ICICI Bank as well. Is this the type of privatisation the CEA and RBI are targeting? Who knows? A twenty trillion rupee GDP cannot afford the luxury of bad banking, bad governance and dual regulation. NITI Aayog would do well to set up an independent committee to clean up bank stables. 'We Bankers', an online forum that has turned into a bankers’ union, led by young generation of bank employees is gathering momentum among bank employees. It cuts across the officers and clerical cadre. By claiming to take up more contemporary issues, it has begun to rattle the big established bank employee unions - which have separate bodies for officers and other employees. What separates both these is the increased use of online media platforms by the young generation to create interaction with every banker across the country. "We Banker' claims that it is just an ideology to change the current system of bank unions for demanding their legitimate rights. Unlike the traditional bank unions who do not have a social media presence and have only recently begun to use WhatsApp and other sharing platforms, @WeBankerss has a twitter account up and running to communicate with the group, and makes effective use of hashtags. They also have a website, http://www.webankers.in, which is updated regularly. The number of followers is still only pushing 12,000, but will grow if it manages to make its voice heard with the government and bank managements. I never understand why #UFBU and Unions frightened by us. We are Unions, we have made it by our names. Its us not an alien. What we get from Unions??? Just nothing. Whatever IBA gives they take and we suffered. 'We Bankers' was set up to resolve issues related to IDBI Bank and its privatisation. Interestingly, this issue has also been taken up by the traditional unions, but clearly, some bankers believe that more needs to be done. With increased support, mostly from new generation of bankers, it is expanding the scope of its operations. The website says, "We bankers is a voluntary organisation of bankers in India whether officers or workmen-whether working or retired. It has been established for heralding the voice of Bankers across India and is committed to bring back the lost glory, dignity and self-respect of bankers which have since been lost through last five Bipartite Settlements." 'We Bankers’ also found mention at the youth forum of the All India Bank Employees Association (AIBEA) on 25th March, where a former defence officer from Gujarat urged AIBEA's leadership to embrace social media putting across bankers' views. Interestingly AIBEA is still not on social media, although it has been ahead of other unions in engaging with customers and supporting their view that customers cannot be fleeced to paper over bad loans. ‘We Bankers’ on the other hand has not engaged with customers at all. It is also challenging the United Forum of Bank Unions (UFBU), by alleging that UFBU collects is money from unions but is not taking forward the demands of bank employees. UFBU is sitting on a pile of Money, collected through Unions, hard-earned by Bankers. Yet they say that banker is weakening Unions?? What union has to do in it. Reacting to 'We Bankers' campaigns, allegations and agitations, DT Franco, General Secretary of All India Bank Officers’ Confederation (AIBOC) has reportedly said, "Please do not spread false messages. I met the Finance Minister as part of UFBU. We have not agreed to Financial Resolution and Deposit Insurance (FRDI) Bill. We are the strongest opponents of FRDI Bill and I appeared before the Joint Parliamentary Committee (JPC) and appealed for rejection of the Bill. Has any one of you leaders discussed issues with me? Salary revision is our priority. Safe guarding banks is also our priority. Whichever bank you are working you should meet the recognised union representatives and discuss first before blaming." 'We Bankers’ claims it is not confrontational. It says, “(the) aim of We Bankers is not to confront with existing Unions, rather to co-operate with them to achieve the overall objective of bringing equality at par with Central Government and other public sector employees. We Bankers India is committed to fight as members of the existing unions to bring positive changes in the style of functioning of the existing unions by amending the constitution of unions to ensure complete inner democracy in the working of the unions and making leadership accountable, answerable and responsible towards the members." "One of the main reasons for this pitiable state of our salaries is the Pension Settlement of 1993 and its ineffective monitoring by the United Forum Of Bank Unions (UFBU)," says 'We Bankers', adding, "The retired leaders of UFBU became selfish after retirement and in order to gain benefits, they colluded with Indian Banks' Association (IBA) and agreed illegally for something which is still harming the bank employees till date and would continue to harm in future too if not rectified. We give below the main reason behind present low salary of bank employees making their lives miserable and pathetic." "We joined bank for career not for politics. But when govt and other bodies use banks to spread their personal gains. We have to come here. We are here for what is Rightfully ours,' says 'We Bankers' in one of its tweets. Unions such as Indian National Bank Employees' Federation (INBEF) headed by Subhash Sawant has supported the contentions and frustrations of 'We Bankers' and requested otehr unins like AIBOC to take them seriously. 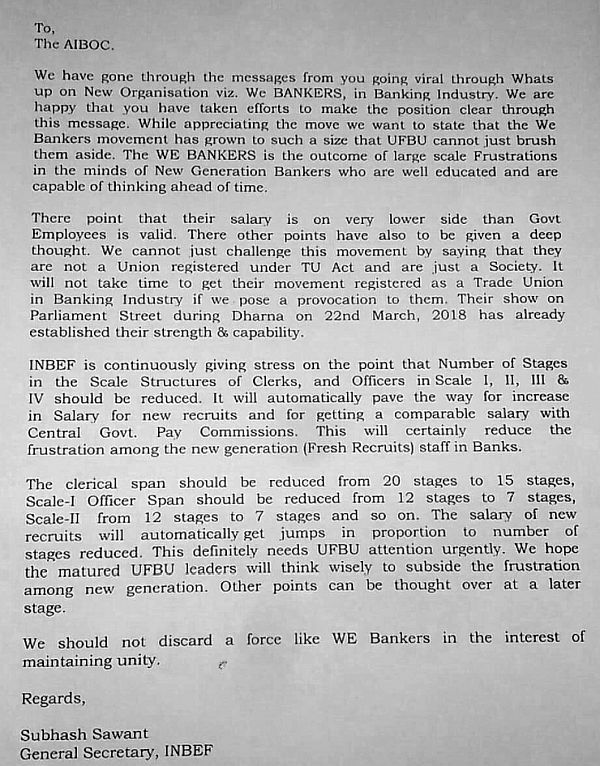 In the letter attached below, Mr Sawant, the General Secretary of INBEF, has indicated that 'We Bankers' comprises young bankers who are aware of their rights and have already established their strength - it would not take long for them to be recognised as an official trade union. Bank employee cutting across cadres are feeling pressure and demoralisation due to the massive bank frauds that have tarnished the reputations of the rank and file, as opposed to bad loans, which were considered a problem created by top management. These frauds have increased the chorus of voices demanding bank privatisation — a brand new union in this situation is an interesting development that will be watched with interest. We Bankers, demanding for CPC forgets that CPC is for government employees and not public sector employees. Moreover CPC has abolished all the grade IV jobs, who form an important in banking industry. Further as per reports 7th Pay Commission may be the last pay commission. How do you explain the position of Kamlesh Chaturvedi, who himself was dismissed from the services of bank just before retirement? WE bankers is a answers to traditional unions who advocating for bepartiate settlement over CPC. Like in so many other industries and departments in India, I have observed that in banking also, the rank and file are scared of their own Union Leaders. I have seen this up front when the Union Leaders visit the Branches. It starts from there. Excellent. Unions like AIBEA/AIBOC etc should just be shut down. Or the SBIOA. All of them are just a waste of time. Nothing to do with banking or HR. When a credit /debit card transaction has a OTP system check, why not for all transactions in excess of day ₹.1lac in a corporate cashcredit /LOU/LIC, either in Indian Rupees or Foreign currency is not instituted is a moot point. Why not do it at least now? Old wine in a new bottle. Socially irresponsible previleged white collar parasite of this third world country. we bankers must know how unionstarted in banking industry and achieved wage settlements! it appears a clever ploy to recruit new and young employees to weaken unions and accelerate privatization! Banks will not remain closed for five consecutive days starting from Thursday, a union leader said on Monday. "The banks will work on March 31 (Saturday) and there is no continuous holidays as per messages in the social media," D. Thomas Franco Rajendra Dev, General Secretary of the All India Bank Officers Confederation told IANS. He said banks will be closed on Thursday and Friday owing to Mahaveer Jayanthi and Good Friday. Saturday will remain open since it is the fifth Saturday of the month. Banks are only closed on second and fourth Saturdays. On April 2, the banks will remain shut for annual closing of accounts. I HANC FOR THE UPDATE. GOOD MOVE BUT THIS IS THE SCENE EVERY YEAR. NOMAL WORKING ON LAST DAYS AND THE STAFF CAN BE GIVEN COMPENSATORY LEAVE. I HANC FOR THE UPDATE. GOOD MOVE BUT THIS IS THE SCENE EVERY YEAR. NOMAL WORKING ON LAST DAY ANDTHESTAFF CAN BE GIVEN COMPENSATORY LEAVE. Four days out of 5 days in the crucial FY ending, banks are closed...isn't that ridiculous?Make the 2 religious holidays optional and give incentives to the employees to take it in April. Also no holiday on April 2nd since everything is automated through core banking system.